We offer a wide range of auxiliary equipment for development and production. All our equipment is produced to the highest standards and cross-compatible with different Bmax systems. Our small footprint, low-complexity workstations are fully adaptable to fit with your specific processes and include a generic work table which facilitates the use of an integrated coil. All stations are available in production or development form and can be segmented to fit into a production line. Our forming stations include a range of press-like tables and other restraining elements. 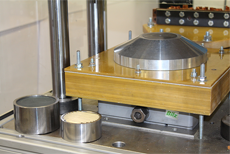 In many cases, forming applications include the integration of a magnetic pulse (MP) element into a conventional stamping line (in the die or in a separate operation). Elements from the magnetic pulse forming (MPF) station are slightly modified to fit into the existing line, replacing a stage or enhancing a feature within a stage. Using our basic table structure, our expansion stations can accommodate multiple coil models with or without a clamping system. Because limited space for expansion applications often creates coil design challenges, we design our stations around the coil – rather than the other way around. 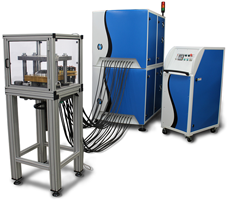 Our welding and crimping stations are designed to accommodate all coil models and a large range of product sizes. Integration of a welding station into an automated line is straightforward and easy, and all our workstations are provided with an optional integral transformer for reducing footprint and complexity. All generic worktables can include an internal Bmax proprietary transformer to manipulate frequencies and currents. Our transformers are separately designed to multiply and change current levels and frequencies at pre-fixed rates and are extremely effective (>90%). The unit enables the customer to use the system in many more ways with higher efficiency together with longer lifetime.